GWCT News & Advisory: 20 years at Langholm – what have we learnt? It was on Langholm Moor (1992-1997) that the GWCT and partners1 demonstrated that hen harrier populations can render grouse shooting uneconomic. In six years, harrier numbers rose from two to 20 pairs. Shooting was abandoned because the hen harriers ate over a third of all grouse chicks that hatched. With no grouse shooting, the local culture, economy and employment suffered and the control of generalist predators ceased. 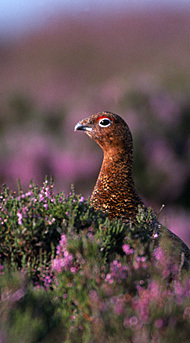 By 2003, 20 harrier nests were back down to two and numbers of breeding grouse and waders had more than halved2. Predation was identified as the most likely cause of the declines. Grouse moor managers felt their worst fears had just been proven – this was a real lose-lose situation. …and thereby demonstrates how to resolve the conflicts between raptors and red grouse. How is it going? How easy is it to run a grouse moor? There is, now, a much better understanding of the challenges – but Langholm has not yet resolved its core objective. Why have the grouse not recovered? The quality of keepering and legal predator control is good, as is grouse health, but grouse mortality all year round is high and 78% of adult grouse found dead were identified as having been predated by raptors. It would be easy to give up now, but the partners at Langholm believe they can pass all five conservation tests – if new conservation ideas are used. The fact that all sides continue to work together in search of a solution is what makes Langholm unique. It remains the only place in the UK that can not only test, but also monitor, new ideas to resolve the conflict between raptors and grouse. 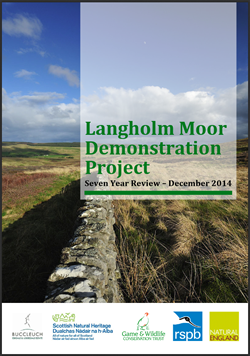 The Langholm project hopes to publish its plans in early 2015. These are likely to focus on raptor predation because existing monitoring indicates that grouse recovery is not being restricted by habitat, disease, lack of food, weather or other mortality. 1 The Joint Raptor Study (JRS) was a collaborative research venture, undertaken jointly by the GWCT and the Centre for Ecology and Hydrology (CEH), but funded and guided throughout by a consortium of interest groups that included the RSPB, Scottish Natural Heritage, the Joint Nature Conservation Committee, the Game Conservancy Scottish Research Trust, Buccleuch Estate and Peter Buckley of Westerhall Estate. 2 Baines, D., Redpath, S.M., Richardson, M., & Thirgood, S.J. (2008). The direct and indirect effects of predation by Hen Harriers Circus cyaneus on trends in breeding birds on a Scottish grouse moor. Ibis (Supplement 1), 150: 27-36. 3 The Langholm Moor Demonstration Project (LMDP) is a partnership between Scottish Natural Heritage, the Buccleuch Estate, the Game & Wildlife Conservation Trust, the Royal Society for the Protection of Birds and Natural England. - the comparison of grouse numbers with other grouse moors seems flawed based as it is on an average between 2009 and 2012. Not only is this starting from a very low base but it misses the upward trend since 2012 which should be seen as encouraging. This is clearly not comparing like with like although interestingly the other grouse productivity measures for Langholm are comparable with other Scottish grouse moors. It seems to me that the review’s objective is to paint the worst possible picture in terms of grouse numbers and the impact of raptor predation. The report itself shows grouse numbers recovering towards the target. Even taking into account that the target density has been bizarrely increased to cover a 25% reduction in the grouse’s core habitat, this represents progress. Numbers of grouse shot at Langholm have been in decline since the 1930s because of a number of factors mostly unrelated to raptor predation. The report’s claim that the resumption of a viable grouse shoot at Langholm is now only threatened by raptor predation seems at best made on shaky ground and at worst a disingenous attempt to give credibility to the legalised removal of birds of prey from grouse moors. I await with interest to see what is proposed in the “next steps” paper. Nice analysis Ian. You should arrange a visit to speak to the RSPB scientists who supplied the data on site. It is, as you point out, still as clear as a peaty burn. The most efficient predator that needs control is man with gun, trap and poison. Nature does not need help in natural predator control. Profit is the driving factor that sustains the shooting estates argument, to kill all predators (except man). I know that protected species status upsets the estate management but we all need to obey the laws of this country, don't we? Then what do you do? Go out and have jolly good shoot (for fun) and of course fat profits. Decimate the population of the "precious" game birds! Then intensive grouse/ pheasant breeding to produce more gun fodder to waste. It is time that the shooting industry especially the archaic driven game shoots, grew up and joined the 21 century.